Whether you’re the groom, father of the bride or a wedding guest, we’re sure you’ll want to look your absolute best at any wedding you’re going to this year. But choosing the right wedding suit can be a little daunting, especially if you’re don’t regularly wear a suit. To help you make the right choices, we’ve put together a quick guide to getting your perfect wedding suit look. 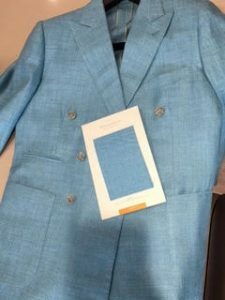 In addition, you can always contact us on 770-458-8682 or you can book your free style consultation online at https://hktclothiers.com/appointments/. In it, we can discuss your personal style and the hundreds of sartorial options open to you. Above everything else, what’s absolutely key to you looking stylish, comfortable and confident is a suit that fits you perfectly. At HKT, we take a series of precise measurements from around your body and carefully consider the unique characteristics of your physique to create a personalised pattern (ie blueprint) for your suit. This ensures your suit jacket fits exquisitely around your shoulders, chest and waist, both when it’s buttoned up and left open. It also guarantees that the length of your jacket sleeves is perfect, with about half an inch of your shirt cuff showing. 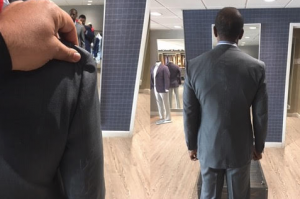 And it makes sure the length of your suit jacket is exactly right, which typically means it falls past the waist and drapes over the top of the curve formed by your buttocks. Our meticulous eye for detail also ensures your wedding day look will consist of a pair of pants that exude sartorial elegance. This means they will break perfectly over your shoes and drape smoothly over the shape of your rear. As a result, you’ll have no horizontal wrinkles on your seat because your pants are too tight, and there’ll never be any U-shaped sags at the top of your thighs because the fit of your pants is too loose. On top of all of this, we’ll also talk to you about the type of fit you like to wear when it comes to suits and other clothing. For example, you might like wearing slim fitting clothes which flatter your physique and create a slender silhouette and contemporary look. Or you may prefer a more regular, classic cut, which offers more room for comfort, and which is ideal for men with larger builds. At the moment, we’re receiving lots of orders for bespoke wedding suits made from navy fabrics. These are often being matched with a custom made white dress shirt, to create a classic, timeless look. To be honest, you really can’t go too wrong with this color combo. It looks great and leaves you plenty of scope to choose any colored tie you want, from a plain matching navy one to a much bolder floral print. Also popular right now are wedding tuxedos in black, matched with a white dress shirt and black tie. These are predominantly worn by grooms and their groomsmen, although the popularity of weddings where all male guests wear a tuxedo is increasing. If you’ve been invited to a big day like this, why not go for something a little different to the traditional black? We can create exceptional made to measure tuxedos in navy, burgundy and green. When choosing the color of your suit, it’s also very important to think about the season the wedding your attending will take place in. For the spring and summer months, you’re more likely to go for lighter colors, and for the fall/winter months, we recommend you go for a darker suit. Currently for the warmer months, we really like the contrast of a light colored jacket matched with darker colored pants or even vice versa. This delivers something fresher than your traditional one-color suit and offers you a great opportunity to wear different tones that suit your personality. For the colder months, we’re still huge fans of forest and moss green for a one-colored suit. 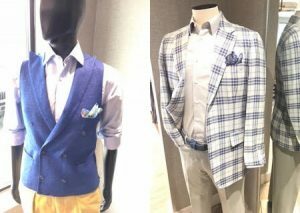 But our number one picks for the fall and winter at the moment are definitely checked fabrics from the likes of Scabal, Dormeuil, and Holland and Sherry. Whether you go for a bold windowpane pattern in grey or a navy suit with a much smaller houndstooth check, you will be bang on trend and own a suit which can be easily worn in the office and for other social events. Overall, though, when it comes to choosing the color of your suit, the best thing to do is book a style consultation with us and begin to look at the fabrics we stock and the suits we’ve previously created. This way you’ll get a much better idea of what options are available to you and which fabrics work particularly well with the color of your complexion and hair. One of the most important elements of a new wedding suit is the weight of the cloth. Lighter weight materials such as linen and flannel are fantastic for summer months because they sit lighter on the body and the weave of them allows for more airflow, which keeps the wearer cooler. Wool is also still an option for the warmer months if it’s been woven to create a light weight fabric which is around 310 grams per square meter or below. This all may sound a little technical, but don’t worry, we can talk you through all the different options available to you with regards to fabrics for the spring and summer. Also, there’s nothing quite like coming into our store and feeling fabrics in your hands to get a better understanding of them and how they will feel next to your skin. If you’re attending a wedding in the fall or winter months, you should be looking for a heavier cloth which weighs between 310 and 400 grams per square meter. Cloths that typically fall in this range are heavier wools and flannels and tweeds, of which we have a fantastic range for you to choose from. Although, of course, your choice will totally depend on what the average fall or winter is like in the area your wedding is taking place – December in Hawaii is very different to December in Seattle. As well as keeping you warm, a fall/winter fabric is much better at maintaining its structure than cloths suitable for warmer months. As a result, a handmade suit in a heavier fabric is excellent at retaining its shape throughout a wedding day and treating wrinkles with disdain. What we also love about heavier fabrics is that they offer more texture than light weight cloths. This simply adds a tactile level to your suit which allows you to express your personality and individual style in an additional way. The accessories you choose for your wedding day look can be just as important as the suit itself when it comes to injecting some personality into your outfit. For that reason, it’s extremely important you take your time selecting your accessories and choosing high-quality products that do you and your bespoke wedding suit justice. Without doubt, the most important accessory you’ll choose is your tie, whether that’s a long tie or a bow tie. It needs to complement your suit and shirt, as well as your own coloring and style. 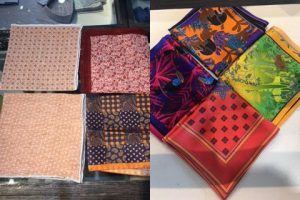 At HKT, we’ve got a great range of sumptuous Italian silk ties you can choose from, as well as bow ties created by artisian tailors. We also stock a number of other accessories that are perfect for finishing off a new custom made wedding suit. These include premium pocket squares in a wide range of colours and patterns, contemporary and traditional cufflinks, luxury Italian socks by Marcoliani, premium suspenders, flawlessly crafted leather belts and a superb selection of designer sunglasses, which are ideal if you’re attending a summer wedding. So there you have it, our quick guide to achieving your perfect wedding suit look. We hope it inspires you and helps you make the right choices for your big day or a wedding your attending in 2018. But, of course, to get the full lowdown of all the options available to you, and to receive expert guidance on what style, colors, fabrics and accessories will work best for you, we recommend you book a free style consultation with us. Simply call us on 770-458-8682 or email team@hktclothiers.com and we’ll organize a time for you to come meet one of our stylists.